I have spent a LOT of time in the Caribbean in the past couple of years, and rum drinks abound there. Cruzan Rum is original to St. Croix, and Captain Morgan moved its operations there in [I believe] 2010 from Puerto Rico. Both are wonderful rums! Hmmm, pineapple juice, rum and cream of coconut…that sounds familiar… This brings us to the Piña Colada, which is original to Puerto Rico. Barrachina Restaurant is considered by many to have made the original, though this is disputed by The Caribe Hilton (who claim to have invented it about 10 years prior to Barrachina). I’ve been to Barrachina, and I’m not sure if what they serve is the original recipe, but it was a frozen pre-made concoction. I cannot vouch for the taste of the Caribe Hilton as we did not make it there. 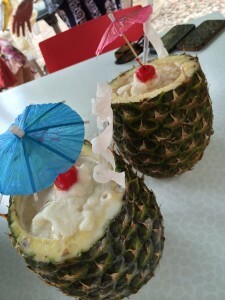 My husband and I found our favorite piña colada at a place called Moreno Spot. Theirs was made to order and served in a hollowed out pineapple (the juice of which was actually in the drink!). It was $12 and well worth it! So…What is YOUR favorite recipe using Rum? And do you have a preferred rum? Add ice to a cocktail shaker and pour the first 4 ingredients in…shake to mix. Pour into the glass (I include the ice) and grate nutmeg over the top. Garnish with an umbrella, preferably speared with a chunk of pineapple and a cherry. Sit back, admire your concoction…then sip. Repeat until glass is empty. My favorite rum treat is a “baba au rum” which my Mom used to make when I was a kid. I don’t have the recipe but I can attest this drink is dangerous because you don’t even notice the alcohol in it. If I ever get this recipe from someone in the family, I will post it.